From a virtual unknown in a remote archipelago in Indonesia, the Banggai Cardinalfish became an overnight sensation among marine aquarists and, now 20 years later, its striking beauty, bold attitude and fascinating breeding habits keep it in the perennial listing of top10 most-sold saltwater aquarium fishes. CORAL Magazine September/October 2013 Issue. Click to enlarge. The next issue of CORAL will bring a special report on the state of Pterapogon kauderni in its home waters, as seen by the Banggai Rescue Project Science Expedition composed of marine biologists from the United States and Indonesia. The fish is officially listed as “Endangered” by the IUCN, but what is really happening to wild stocks? Can small-scale breeding efforts by marine aquarists help lighten the impacts of wild collection? 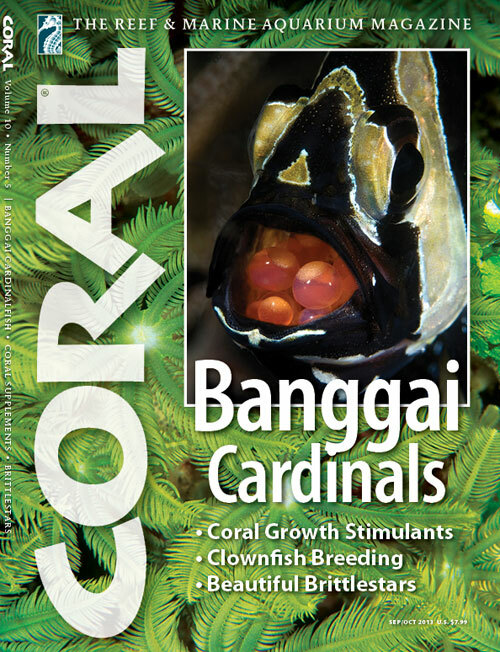 Look to the next issue of CORAL for an exclusive excerpt from the forthcoming The Banggai Cardinalfish book. Almost two years in the making, the book was writtten and photographed by a team of CORAL contributors, including Ret Talbot, Matt Pedersen, Matthew L. Wittenrich, Ph.D., Roy Yanong, V.M.D., and Thomas Waltzek, D.V.M., Ph.D. with Martin A. Moe, and a Foreword by Dr. Gerald R. Allen, the ichthyologist who rediscovered the Banggai Cardinalfish in 1994. Images by leading underwater photographers, including KORALLE Editor Daniel Knop, Scott Michael, Denise Nielsen Tackett, Roger Steene, and others. • Beautiful Brittlestars: Daniel Knop looks at the underappreciated and often astonishingly beautiful brittlestars that can make their way in reef aquaria. • Coral Supplements: Murray Camp interviews Dr. Han-Werner Balling on the evolving art of stimulating coral growth and color. • Clownfish Breeding: Dr. Rudiger Bless reports on successfully breeding the Cinnamon Anemonefish, Amphiprion melanopus. • Underwater Lembeh Strait: Werner Fiedler takes the reader on a tour of the aquatic wonders of one of the world’s most revered dive destinations. • Hydroids from Hell: Dr. Ron Shimek discusses a group that plagues many fishkeepers and breeders but that zoologists find irresistible. Deadline for materials to be included in this issue: August 15th. The issue has an on-sale date of September 10th. The Banggai Cardinalfish will be published by Reef to Rainforest Media, LLC and exclusively distributed by Two Little Fishies. On sale date: August 27, 2013.